FILE - Zimbabwean President Robert Mugabe. Outrage against the nomination of Zimbabwe’s president as a World Health Organization goodwill ambassador led to his swift removal from the post over the weekend. But the outrage appears strongest in his home country, where Robert Mugabe is largely blamed for ruining his nation’s economy and health system during his 37 years in power. Dr. Fortune Nyamande said he could think of 4,000 reasons why President Robert Mugabe was a poor choice to be goodwill ambassador for the global health body. Four thousand, he says, is the number of Zimbabweans estimated to have been killed by cholera in 2008 and 2009. Cholera is widely seen as an indictment on modern health care systems, as the waterborne disease rarely causes deaths in developed nations. 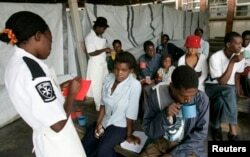 FILE - Cholera patients drink treated water inside an admission ward at Budiriro Polyclinic in Harare, Zimbabwe. The state of Zimbabwe’s health care system, says Nyamande, who heads the Zimbabwe Hospital Doctors Association, can be laid squarely at Mugabe’s feet. Not that Mugabe has to endure this, says Dewa Mavhinga, southern Africa director at Human Rights Watch, which also condemned last week’s appointment. “Mugabe himself has been engaged in medical tourism, frequently flying to Singapore to seek medical attention, leaving behind in Zimbabwe a totally collapsed and useless health sector,” said Mavhinga. But Mugabe still has cheerleaders within his ZANU-PF party, who say the decision to rescind the post is a sign of international bias against Zimbabwe. Mugabe has claimed for years that Western powers are suffocating his nation with sanctions. Opposition politician Douglas Mwonzora disagrees. "Every right-thinking Zimbabwean, on social media and in other modes of communication, was condemning the appointment. And for them to say that it is the British and the Americans is simply to find a scapegoat. We, the Zimbabweans, did not want it,” he said. Zimbabwe’s state-run Herald newspaper, long seen as a mouthpiece for the ruling party, has yet to weigh in on the issue.